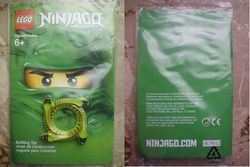 4659612 Spinner Crown is a promotional Ninjago set released in 2012. It was given out free with Ninjago products in King Jouets, France, in May 2012. The set came in a polybag with the Green Ninja in the background. It includes a green Venomari spinner crown. Facts about "4659612 Spinner Crown"